Tomorrow is Easter Sunday for most Christians. The weather is finally shaking off the winter blues with a spate of near normal temperatures. Today’s high of 55°F was actually above the normal high of 50°F for this date. The morning started out clammy and dreary, but the sun and gentle breeze pushed the fog and haze away. It was also the first day of enjoying the three season porch for more than a few moments. Several inches of snow cover vanished today and the furnace has made nary a sound since early this morning. The ice pack in the back yard has rivulets and chasms carved out by snow melt working its way to the drainage pond at the end of the cul-de-sac. People were outside tinkering with lawnmowers and weed trimmers anticipating lawns turning green. Spring is staking its claim. Bird activity increased when the sun broke through. Three pair of cardinals plus a couple of males looking for mates spent most of today scouting nesting locations and drinking from the bird bath. An inquisitive black-capped chickadee spent several minutes clinging to one of the porch door screens peering in. I have heard robins for several weeks but have not seen one yet. No signs of the snow birds (juncos) that were common at the start of the month. One sure sign of spring is seeing a turkey vulture gliding on the thermals near the Minnesota River. Even the “bird brains” have figured out spring is near. I think I have some squills poking though near the garage. That garden has western exposure and seems to thaw the fastest. The lilacs have fat leaf buds at the ready, waiting for another couple of days of sun and warmth. Flower buds are getting larger on the forsythia. It usually blooms by mid-April, so it is right on schedule. Easter is the time for plants to resurrect from the dead and for hibernating creatures to awaken. The sidewalks are somewhat treacherous. Snow melt runs down the sidewalks and will freeze in shady areas. Lubricating a low friction icy surface with water guarantees causing unexpected equilibrium shifts, which can result in a painful and wet fall. I know a few of you will be traveling this weekend; I am going to John’s house tomorrow. Mom and Dad are scheduled to be there. The weather in southwestern Minnesota might be a bit tricky tonight with a threat of freezing rain and snow. I wish a happy birthday to Diane tomorrow. Take a few minutes to give your loved ones a meaningful hug and let them know you love them. Enjoy your day tomorrow! We are having a mild winter in the Twin Cities thus far. The snow cover held off until November which helps make the season seem shorter. Unlike the winter of 2010-2011, there have been no protracted cold spells or a seasonal record-setting snow. I am ready for Spring’s calendar arrive tomorrow, but like many others in this region, Spring’s timidness this year puzzles me. It reminds me of a cat that is afraid of visitors and streaks across the room to find a hiding place. After several hours and some coaxing, the cat finally appears and finds a new lap to nap on while getting a belly rub. Last year spoiled everyone in my area. We had a stretch of ten days that recorded or tied record highs in eight of them. Yesterday’s high temperature of 29°F was 50°F colder than last year’s record high of 79°F. The latest weather quirk has been threats of blizzards or heavy snow on Sunday night. This week was no exception, and there are rumors that next Sunday night may bring in near-blizzard conditions to southern Minnesota and Northern Iowa. Take solace in the fact that weather forecasters have been predicting snowfall amounts higher than what actually falls. Perhaps that trend will also continue. There is still 6″ of snow cover here. Easter egg hunts in snowdrifts might be expected next weekend. 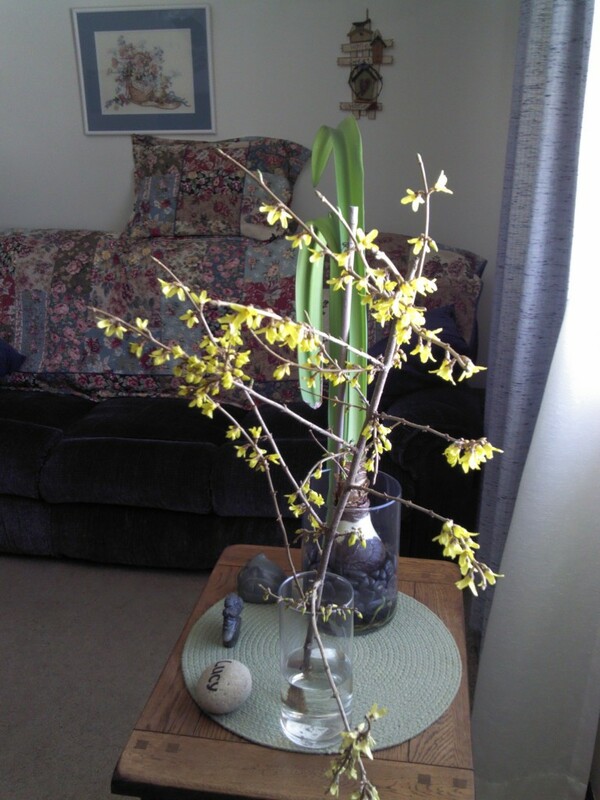 My forsythia cutting started dropping flowers last Wednesday. I think it bloomed for over two weeks. To help break up the monotony of snow and grit, I bought a small orchid. 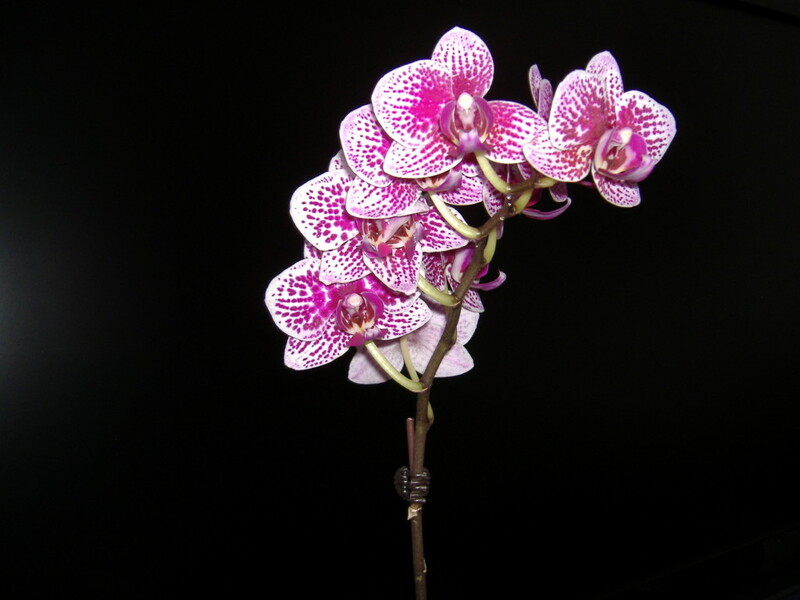 Orchids are not expensive and even if I am unsuccessful at rejuvenating it after it goes dormant, I can get another. The snow blanket is also keeping me from getting the gardens ready for spring. I have my dahlias started in plastic coffee cans to try extending the bloom season. The gladiolus and Asian lily bulbs destroyed by chipmunks and squirrels last year have replacements at the ready. The local garden centers do not have tulip bulbs yet. I’m going to try a Gloriosa lily variety this year that Lucy liked. I purchased all the usual annual seeds and they are waiting to go into seed starter containers: scarlet flax, borage, bluebonnet, sunflower and morning glory. This year’s seed experiments will include cypress vine and castor bean. Both plants are critter-proof because they are bitter and have emetic and laxative properties. This could lead to some “clean up in aisle one” moments. I have a fenced-in back yard and there are no children in the neighborhood under age 12. I am hoping for a decent growing season this year. Lucy enjoyed gardening. I think the reason she enjoyed it so much was looking at the colors and life, and watching the birds and butterflies visit. We figured out how to optimize our gardening effort, which gave us more time to enjoy the result. Like last year, there will be twice as much gardening work for me. Unlike last year, Lucy is not here to encourage me. I’ll get it done though. Of course, if anyone wants to help, I’d appreciate it. Give your loved ones a meaningful hug and let them know you love them. Try to smile today. If you’ll excuse me, I have to find a way to coax Spring out from behind the dryer. What do you consider “home”? Is it the house you grew up in? Is it the first place you lived in after moving out on your own? Is it the house you bought with your spouse? I know some of you moved often during your childhood. Others of you spent time in one or more foster homes before adulthood. Still others are renters and quite satisfied with not worrying about maintenance. When we were younger, we could not wait until we could start our new adventure. What we didn’t know then is that adventure culminates in finding our new “home” and building new memories. I think we go through a restless period akin to Goldilocks sampling the porridge, chairs, and beds in the Three Bears’ home. We may not know what we are looking for, but we know when we find it. Home is the place where you made the most memories, where you felt safe, grounded, and surrounded by love. Even as adults, many of us consider “home” as the place we grew up, not the place in which we currently reside. Home is where the heart is. I consider two places as “home”: my primary home is the house Lucy and I bought and my other home is the house my parents now live. One difficult transition we can face as adults is the sale of our childhood home. Lucy’s siblings found a buyer for their parent’s home and it has been bittersweet for them. The transition is a loss and reminds us that time marches forward even if we may not like the tempo. What was once familiar and comforting has changed. Someday I will be unable to maintain my home, which will probably require me to move into a senior’s center. I will have my memories of home to help me make that transition just as memories of my time with Lucy help me transition to a life without her. In both cases, one can hope the new owners will start building memories of “home” there and have love and joy fill the rooms. The mind’s power is what helps us cope with the myriad of changes modern life sends our way. We cherish those memories of home, each one a thread woven into our life’s fabric. We use that fabric to shelter us from the unpleasantness that sometimes arises in life. As such, we never lose “home” unless we want it to go away. It will always be with us because it is part of us, providing us with peace, comfort, and smiles. You can go home again. Please keep Steve, Suzy, and Julie in your thoughts as they make this transition. Yesterday was “National Napping Day” in areas that switched to Daylight Saving Time on Sunday. I hope that those of you who actively participated did not do so while driving. Other whimsical days this week include “National Pi Day” on Thursday and “National Quilting Day” on Saturday. Holiday Insights lists more if these interest or amuse you. Tomorrow marks eleven months since Lucy passed away. Please think of her tomorrow. Thank you for keeping Lucy in your heart. Things are coming back to normal after the snow event that enveloped the upper Midwest Monday night. Minneapolis St. Paul International Airport reported 9.4″ total snowfall for the storm. Tuesday’s road conditions were terrible in the morning but improved by late afternoon. Keeping the driveway cleared after several passes by the city’s snow removal equipment provided enough cardiovascular activity for the week. Friday night I attended Annette’s birthday party at her shop. Carver is a small quaint town and I believe the majority of the populace attended throughout the evening. Al gave a very touching birthday speech for Annette that made the evening even more special. One of my fortune cookies had the following fortune: “You have a charming way with words and should write a book”. I leave that for you, the reader, to decide. While I was driving to meet Suzy and Julie on Sunday, I saw a large white raptor flying near the Minnesota River. The airport has had snowy owl sightings reported this winter and the Minnesota River flows just southeast of the main terminal. Spring is showing more influence even though Winter may have briefly regained the upper hand. I saw several bald eagles circling my route from Bloomington to St. Louis Park. House finch songs are filling the air. Maple tree sap is running judging by the drops on my driveway and the lilac leaf buds are swelling. Hawks are soaring in pairs. Potholes dot the roadways and the ubiquitous orange cones and detours are appearing on schedule. The dead season of winter is transitioning to the rebirth season of spring. I neglected to include a picture of the blooming forsythia cutting in my last post. It is part of this edition. The leaf buds are starting to appear and the flowers will fade in another week or so. Enjoy your spring sightings and give your loved ones a hug! Today’s weather was a “pull my finger” sort of day. The heavy snowstorm threatened for last night took a more leisurely route and may arrive tonight. A Winter Storm Advisory issued Sunday morning became a Winter Storm Warning by Sunday afternoon declaring 7″ – 12″ of snow during the day Monday. Mother Nature gave us a “pull my finger” joke with the delay. I’m a very logical, linear person and that can cause some “pull my finger” moments, as Lucy found out while we were dating. We learned quickly how to adjust, mostly with me adjusting to her communication style. My sister-in-law Julie has had the misfortune to experience a few of these moments, yesterday included. I feel badly that she ends up as the occasional (I hope) locus of my foibles and I am deeply grateful for her good humor and patience. I really am lucky having Julie and Suzy in my life. Movie listings in the daily papers, on Yahoo! and on Google presented a “pull my finger” moment yesterday with a bogus showing time. Suzy, Julie, and I had planned on lunch and a movie yesterday. We settled for lunch at TGIFriday’s. It was still a very nice day despite the “Keystone Kops” subplots. Parking in downtown Minneapolis is usually a “pull my finger” ordeal. During an event, parking downtown has a finishing touch of a flaming bag of dog poo. There are numerous restaurants worth the trouble of finding near the Convention Center. Check the Minneapolis Convention Center event calendar before making the trip, trust me on that. It’s been nice getting a chance to see some long-time friends. I’m catching up with Susan, and I have to make plans with Mike and Ken next week. The Forsythia cutting is in full bloom, which is about three weeks earlier than I expected. It is a welcome splash of color and a reminder that spring is on the way in sixteen days. Another sure sign of spring are the seed and gardening catalogs arriving in the mail. Jung and Burpee seed catalogs are here and the Spring Hill Nursery catalog will probably arrive yet this week. Lucy had planted some Gloriosa lily bulbs a couple of years ago and I would like to try them again. It’s time to get the dahlia tubers in some dirt and start the seed tray. I have completed the blog conversion. Facebook has been problematic with group notifications, so I have created a “Journey of the Teal Owl” page. If you could take a moment and “Like” the page, it will help with future notifications. I’m still discovering features with the WordPress software. Let me know what you think! Having fun with loved ones is always a pleasure. Some of you like to play practical jokes. Let that special someone know that you care, hopefully without having him or her pull your finger.